Chewy is your one-stop shop for your furry family. Whether you're running low on dog food, dog treats or are looking to get your best friend some new dog toys - we have everything your dog needs (and wants). 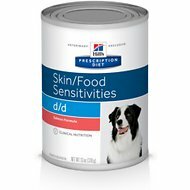 If you've been searching for salmon flavor dog prescription food, look no further. 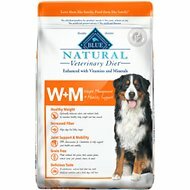 Among the wide selection we carry, one option to try is Blue Buffalo Natural Veterinary Diet W+M Weight Management + Mobility Support Grain-Free Dry Dog Food. Key benefit: a wholesome and natural diet made with the beneficial nutrition your dog needs and the taste she loves. 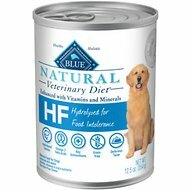 Another product is Blue Buffalo Natural Veterinary Diet HF Hydrolyzed for Food Intolerance Grain-Free Canned Dog Food. Key benefit: formulated to help minimize negative reactions to food with hydrolyzed salmon - a readily digestible source of protein. From healthy dog food to fun dog toys, Chewy has it all! You'll find everything you need - and if you have any questions be sure to reach out to our customer service available 24 hours a day, seven days a week. 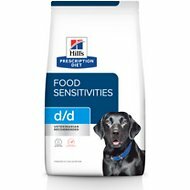 For all your pet needs including salmon flavor dog prescription food, Chewy has you covered! We're here for you.